In the autumn of 2000 I bought five + one cassettes on a flea market. There was not much written on the tapes, but enough to attract my attention. It turned out to be acapella gospel music, recorded in Nigeria, probably in the late seventies or early eighties. Some recordings seem to be taken from vinyl, but others were taped live during rehearsals. The various takes, mistakes and abrupt endings of some of the songs leave little doubt about that. The sound quality is not very good, as can be expected from 30 year old cassettes from cheap brands like Sorex and Pacific Stereo. I don’t know anything about Nigerian gospel music, but I loved these tapes so much that it was one of the first CD’s I burned on my Traxdata audio CD recorder. That was a wise decision, because for some mysterious reasons the cassettes have disappeared soon after. 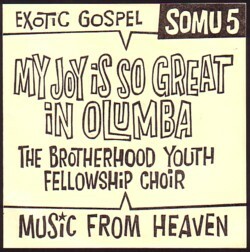 There was no information about the singers or the songs on the five tapes, but there was a sixth tape with six songs by The Brotherhood Youth Fellowship Choir. That tape was “officially” released by the Brotherhood of the Cross & Star in Lagos, Nigeria. The songs on the sixth tape didn’t have half of the soul that the songs on the other five tapes had, so I didn’t use any of these for the CD. I think that it is the same choir on all the cassettes, but I don’t know for sure. And until the tapes show up again one day, I will never know. There are 21 songs on the CD, most are in English but a few are in Nigerian. I wish I could share the whole CD with you, but you have to do it with this track.